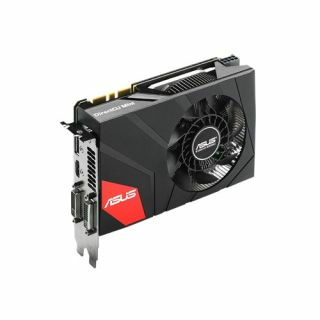 ASUS has announced the GeForce GTX 970 DirectCU Mini—a miniature version of the powerful GTX 970 "Maxwell" card perfect for small, mini-ITX gaming systems. The diminutive card measures only 17cm in length but packs the same amount of VRAM as a full GeForce GTX 970 GPU with 4GB of GDDR5. It comes with a factory overclock running at 1088 MHz and can be boosted up to 1228 MHz. Memory speed remains at the stock 7 GHz. Despite its small size, the card features a full suite of display outputs: two dual-link DVI connectors, HDMI 2.0, and DisplayPort 1.2. As for power, the card uses a single 8-pin PCIe power connector instead of the standard dual 6-pin config. Gigabyte recently released a similar miniaturized GTX 970, but it clocked in at a slightly lesser 1076 MHz (1216 MHz boosted). Both the ASUS and Gigabyte mini-ITX cards are clocked slightly higher than Nivida's reference full-size GTX 970, but due to their smaller size, they won't have quite the same overclocking and cooling potential. Pricing and availability for the new ASUS card isn't out yet, but considering its similarity to Gigabyte's mini-ITX GTX 970, we expect something in the $330 area.